The Smoke Pencil Pro Soft Field Kit from Chimney Balloon is a great tool for professional contractors and energy raters. It will help with the discovery of air leaks in a home or building. The smoke pencil that's included creates the necessary amount of smoke to identify air leaks and drafts. 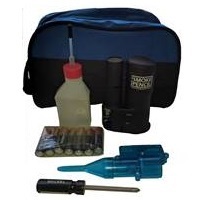 Also included are the accessories, batteries, non-toxic fluid, and a handy and long-lasting carrying case.